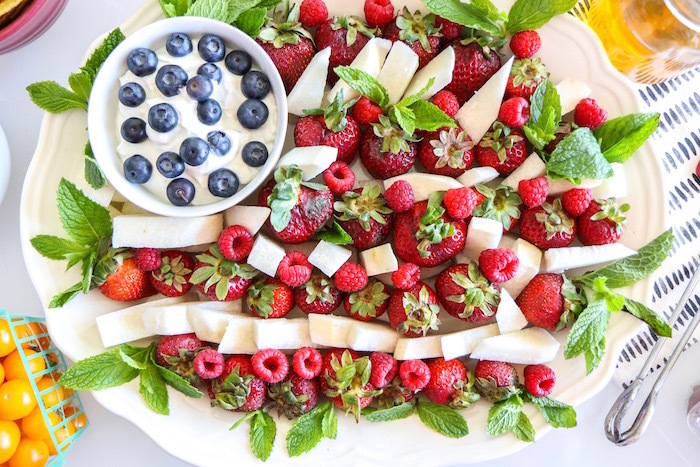 American Flag Fruit Platter: Healthy & Easy! 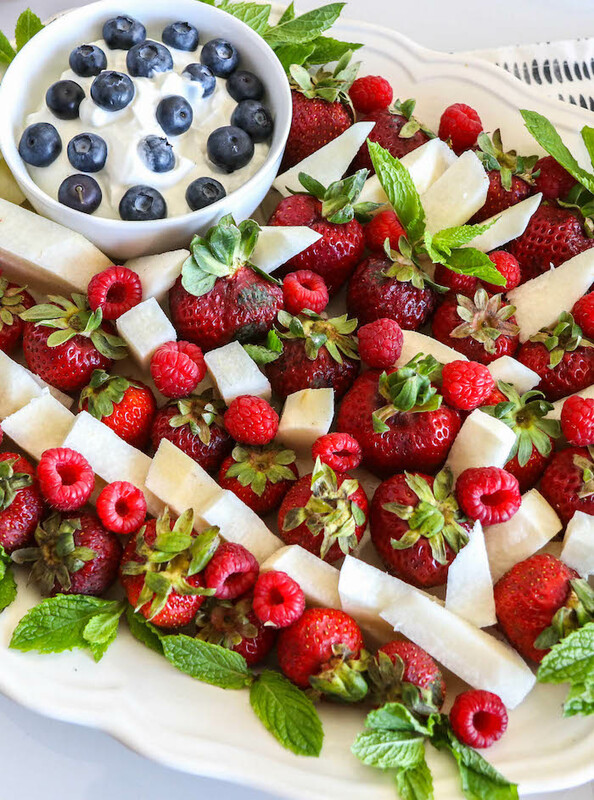 Keep it healthy at your next cookout with this healthy and easy American Flag Fruit platter of berries, jicama and creamy skyr yogurt. ‘Merica! For years I’ve eyeballed American flag cakes and desserts on social media around 4th of July and told myself, “Self, next year you’re making an American flag fruit platter.” And every year it doesn’t happen. I must admit I’m the person who shows up to the barbecue with a store bought fruit platter because I had grand plans to make an amazing spread from scratch but life got in the way and it never happened. I’ve accepted this about myself, it’s just who I am. Until I dreamed up this crowd-pleasing and oh-so-easy American Flag Fruit platter. Store bought fruit platters no more! This year I decided to make a change. I’ll never be the person who whips up an elaborate five layer flag cake with all the trimmings but there are ways to impress that don’t involved hours in the kitchen. Sometimes the simplest foods can be stellar with a little creativity and pizzaz. And this American Flag Fruit Platter is all about pizzaz. How to: build a beautiful (and easy) healthy platter. Have you ever shown up to a party with a healthy dish and only to realize it gets picked over in favor of salty and greasy snacks? Let’s face it, carrot sticks, cherry tomatoes and celery aren’t as appealing as chips and creamy dips (I know, because I love them too). But what if fresh, healthy foods were presented in a fun and appealing way? Who can pass up a fruit platter when it’s in the shape of an American flag? I know I can’t (but not before snapping it to Instagram, of course). Pick what’s fresh and in season. Watermelon in January? Strawberries in December? If you live in California this can be a reality but will they taste good? Choose in season produce for the best taste and presentation in your healthy fruit or vegetable platter. Choose 2-3 ‘traditional’ fruits or vegetables and throw in an ‘oddball’ to trick people into trying something new. I first brought this platter to a barbecue when visiting my hometown in the Midwest and half the people at the party had never tried jicama. Some weren’t willing to try it but most did, which secretly made my dietitian nutritionist’s heart fill with joy. Pair your platter with an interesting dip. We all know and love the traditional dipping veggies like broccoli and celery, so switch up your dip with a new, fresh dip. Try baba ganoush or tzaziki for a savory platter or a honey and fruit yogurt for sweeter fruit spreads. Build it beautiful. 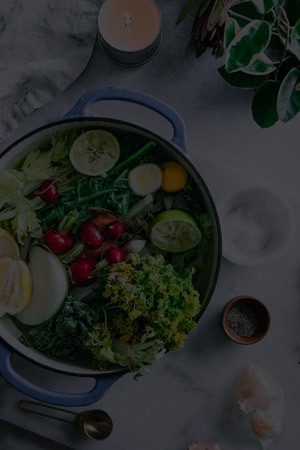 Making your healthy platter visually appealing by creating rows of colors, arranging fruits and vegetables in a color repeating circle or placing produce in an interesting pattern. As visual creatures we can’t resist beautiful food! 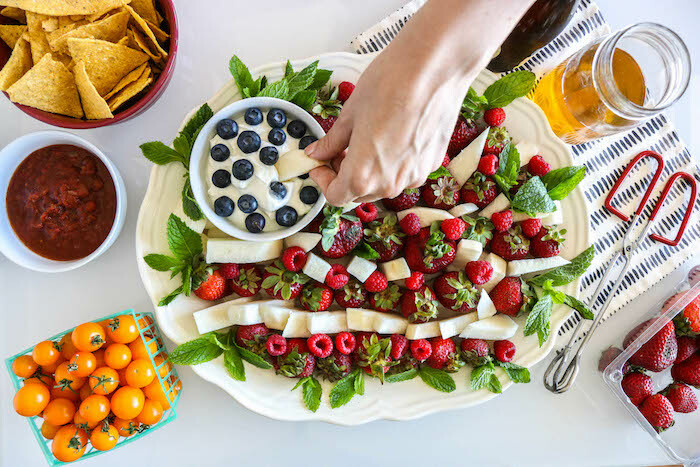 Whether you’re headed to a summer party, beachside bonfire or just plain trying to get your family to eat more fruits and vegetables, this American Flag Fruit Platter is sure to appeal to kids and adults alike. I’d love to hear how it goes over at your next party, be sure to comment and let me know! Love this American Flag Fruit Platter? Thanks to Icelandic Provisions for sending the skyr yogurt used in this recipe! American Flag Fruit Platter: Easy & Healthy! 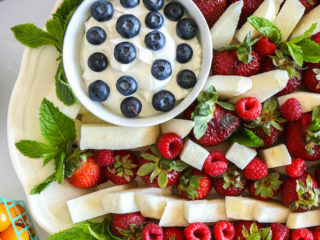 Keep it healthy at your next cookout with this patriotic American Flag Fruit Platter with berries, jicama and creamy skyr yogurt. Yogurt Topping: Place yogurt in small bowl on upper lefthand corner of platter. If using plain yogurt, flavor to taste with honey, syrup or other sweetener. Arrange red fruit (strawberries and raspberries) in row on top of platter, followed by white jicama in a row below. Continue making rows until platter is filled with fruit. Top yogurt with blueberries in shape of stars, garnish with fresh mint and enjoy! Make head! This platter can easily be made the day before and stored in the refrigerator for the next day’s cookout party.